Staff and students welcome University President Thomas LeBlanc at the steps of Rice Hall on his first day in the role. Updated: August 1, 2017 at 3:25 p.m.
Thomas LeBlanc began his tenure as University president with an address to staff on the front steps of Rice Hall and a walk to his office with student leaders Tuesday morning. Students, from organizations like the Student Association and the Black Student Union, met with LeBlanc and his wife inside his home at the president’s F Street House for about 10 minutes before leading him through campus and University Yard for his first day in Rice Hall. LeBlanc said in an interview that he plans to continue to meet with students and hopes to be visible on campus to engage in conversations with students. For his first week, LeBlanc said that he plans to get unpacked and later begin to meet with senior administrators. He added that he looks forward to getting to know the story and history behind GW. 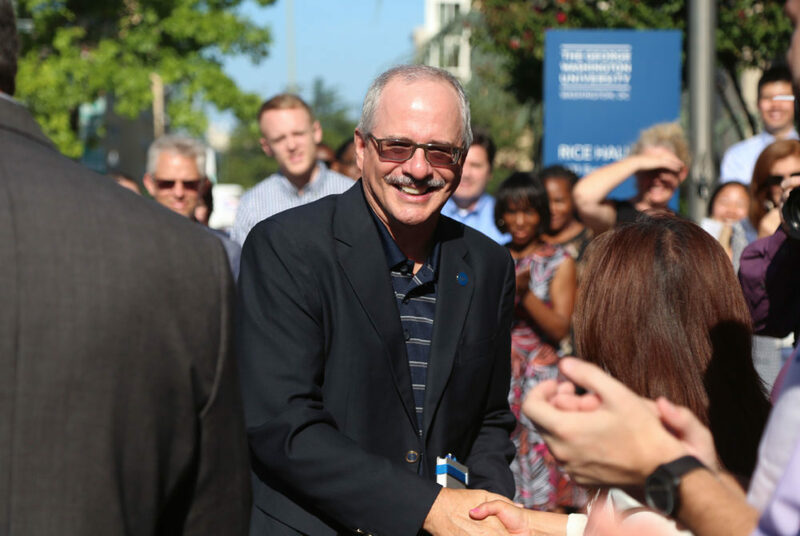 As LeBlanc and students reached the steps of Rice Hall, about 50 staff members stood outside to applaud his arrival. LeBlanc, who was named president in January, said to the crowd outside of Rice Hall that he is looking forward to hosting events in his home and getting to know the faculty and the campus, comparing himself to a freshman in a new city. Six undergraduate student leaders and one Presidential Administrative Fellow joined LeBlanc on his walk to Rice Hall. Sophomore Andrew Hesbacher, a member of GW Band and a Center for Student Engagement employee who joined LeBlanc on the walk, said the meeting could signal that LeBlanc will have a more student-centered presidency than his predecessor. LeBlanc talked about hosting basketball game watch parties at his house in the future, Hesbacher said. BSU member and SA Senator Imani Ross, U–At large, also met with LeBlanc and said he seemed excited to be at GW and asked many questions to get to know the students. On Tuesday afternoon, LeBlanc released a letter where he said he looks forward to meeting, listening to and learning from members of the community.